This 2.5 Carat Canary Cushion Cut Cubic Zirconia Square With Trillions Engagement Ring is set in 14k white gold and features 2.5 carat 8mm cushion cut canary diamond look center stone with .75 carat trillions on each side. 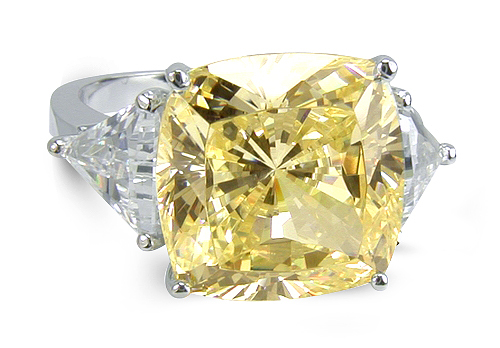 The cushion cut yellow canary center includes 104 facets with slightly curved sides and is set in a four prong basket setting. This diamond quality canary cushion cut ring is great as an engagement ring that can be teamed up with a band of your choice or it can be worn on its own as a traditional three stone ring. Each stone in this ring features Russian formula cubic zirconia that are hand cut and hand polished to diamond specs giving you the best possible finished product with its high quality 14k solid gold mounting. 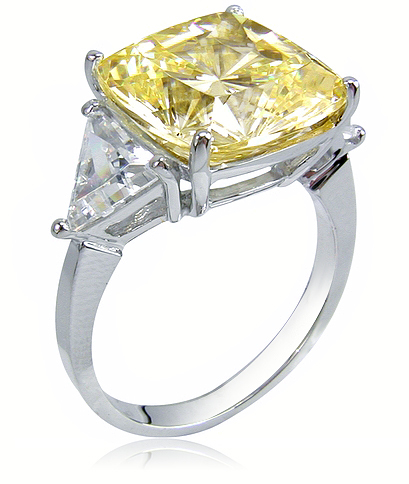 The total carat weight is 4 carats of the finest diamond simulants available. The shank measures approximately 2.5mm at the widest point. This ring is displayed here in 14k white gold but it can also be made in 14k yellow gold, 18k gold or Platinum via special order. Due to extremely low pricing, all clearance sales are final. Clearance items are stocked in a certain finger size(s) and may be sized for an additional fee. Please see menu options. Sizes below a 5 or above an 8 can be made via Special Order. Please call 1-866-ZIAMOND for a quote.